During a secret performance Friday night at The Box in New York, Jay-Z announced he has signed Jay Electronica to his Roc Nation label. 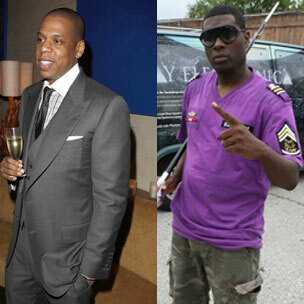 In October, during an appearance on the Hypemen Podcast with Eric and Jeff Rosenthal and Jensen Carp, Just Blaze hinted that a new Jay Electronica release was coming “sooner than later.” Nearly a month later, Electronica gave a sampling of the song “Shiny Suit Theory,” a song Miss Info exclusively reports is a duet between Jay-Z and Jay Electronica. Additionally, Jay-Z’s verse was one of the motivating factors in bringing the New Orleans native over to Roc Nation. After a few years of being mentored by Diddy and Just Blaze, how did Jay Electronica end up as labelmates with J.Cole and Willow Smith?